Marygrove honored a beloved former leader by renaming a campus facility the Sister Helen Negri Administration Building. 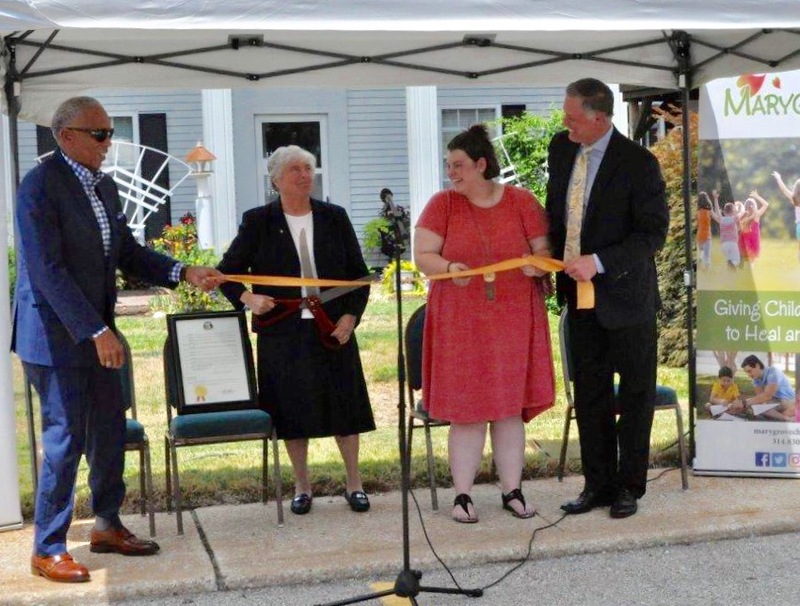 On July 17, Marygrove staff, Florissant community leaders, friends and other supporters showed the retired chief executive officer their appreciation at a building rededication ceremony and reception. Sister Helen led Marygrove – a Catholic Charities of St. Louis agency – for 35 years before stepping down in April. Tapped for the CEO role by Msgr. Robert Slattery in 1983, Sister Helen began with seven teenage girls and grew the agency into a therapeutic residential care program that daily serves more than 200 children with behavioral health problems, providing therapeutic foster care, a transitional living program, crisis services, an independent living program and an onsite school. Marygrove’s North County campus and community-based programs provide treatment and support to young people struggling with emotional and behavioral issues, often resulting from abuse, neglect and other trauma. Through its comprehensive continuum of residential and community based programs, Marygrove transforms over 1,500 young lives each year.